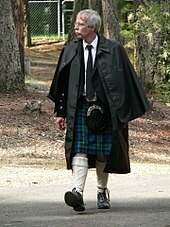 The garment began in the 1850s as the Inverness coat, an outer-coat with sleeves covered by a long cape, reaching the length of the sleeve. [i] By the 1870s, the cape was divided in two, and a small "capelet"-like "wing" on each side was sewn into the side seams, not taken across the back. In the 1880s, the sleeves were removed entirely, and the armholes were cut away beneath the cape to form the Inverness cape. The vampire Barnabas Collins (as portrayed by actor Jonathan Frid) wore an Inverness cape on the cult classic Gothic soap opera Dark Shadows. ^ In comparison, the Ulster coat is similar, but the cape of an Ulster reaches only to the elbows. ^ Waugh, Norah (1964). The Cut of Men's Clothes. p. 143. ISBN 1138870552. ^ a b Davis, R.I. (1994). "Topcoats". Inverness caped topcoat. 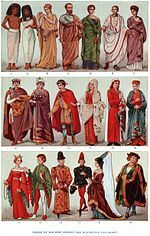 Men's Garments: 1830-1900 (2nd ed.). Players Press. pp. 122, 140–143. ISBN 0-88734-648-0. 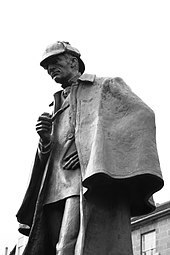 ^ a b c "1850s-1900s Inverness or "Sherlock" Cape". Patterns for Historical Clothing. Reconstructing History. RH940. This page was last edited on 1 April 2019, at 00:30 (UTC).